If you don't have it written down in an easy-to-find place, you're going to find it difficult to display a Wi-Fi network password on your iPhone. Believe it or not, you can't look up a Wi-Fi network password directly on the iPhone unless your iPhone is jailbroken and running apps specifically to do that. Seems weird, right? We've got no idea why Apple would make that choice. 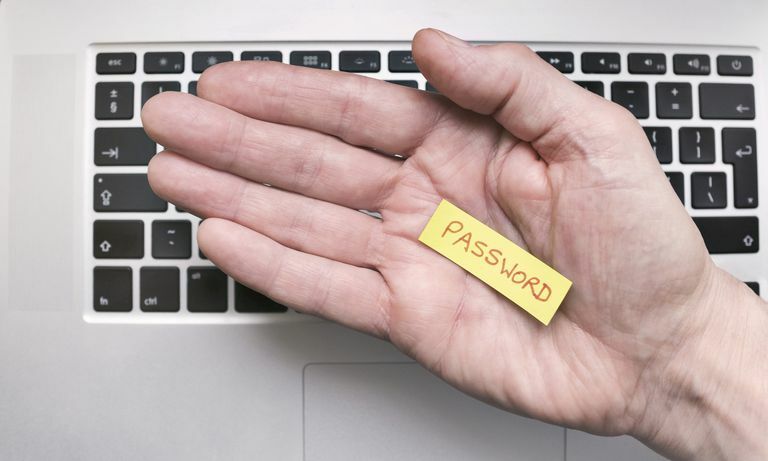 Luckily, there are some other options for looking up passwords and the rest of this article will cover them. Now, if the reason you need the password is to share it with someone, well, then that's easy. If you still need it for another reason, you'll need to turn to your Mac (and we'll show you how that works just below). There's an even easier way to share a Wi-Fi password from your iPhone with a friend. As long as you're both running iOS 11 and up (this actually works on Macs running macOS High Sierra (10.13) or higher, too, but these are iPhone instructions), sharing a Wi-Fi password is a matter of just a few steps. Both devices need to be running iOS 11. Your friend must be in your Contacts app. Bluetooth must be enabled on both your device and your friend's device. First, start by making sure iCloud Keychain is enabled on your iPhone. Tap the Settings app to open it. Tap your name at the top of the Settings screen. Move the iCloud Keychain slider to on/green. Next, on your Mac, to go the Apple menu in the top right corner and then select System Preferences. Click iCloud. Remember, you must be logged into the same iCloud account on the iPhone and the Mac for this to work. Click the checkbox next to Keychain. This enables iCloud Keychain and will sync the password from the iPhone to the Mac. This may take a minute or two. Next, open the Keychain Access program on your Mac. The easiest way to do this is to open the Spotlight search tool by clicking command+space bar. Type Keychain Access and then click the Return key. In the Search box, type the name of the Wi-Fi network whose password you want to view. In the search results, double click the Wi-Fi network. Click the checkbox next to Show password. In the window that pops up, enter the password that you use to log onto your Mac. The Wi-Fi network password appears in the Show password field. There's one last way that you might want to look up a Wi-Fi password: for your Personal Hotspot. Move the Personal Hotspot slider to on/green to enable the feature. Look at the Wi-Fi Password menu. This is the password to your Personal Hotspot that you need to share with people who want to connect to your iPhone over Wi-Fi. You may not know it, but your iPhone is packed full of saved passwords that you use for websites, apps, and Wi-Fi networks. These passwords are saved in the Keychain, a tool stores your login information and helps you by auto-filling them into login forms. If you've got a Mac, you can view Wi-Fi passwords using iCloud Keychain. ICloud Keychain is similar to Keychain except that it syncs all of your usernames and passwords to any iCloud-compatible device signed into the same account. That means that a Wi-Fi password saved on your iPhone can be viewed on a Mac. Hold your iPhone close to your friend's iPhone (or iPad). The devices need to be in close physical proximity to use this feature. Next, on your friend's iPhone, try to connect to the Wi-Fi network whose password you want to share. On your iPhone, a window will pop up asking if you want to Share Your Wi-Fi. The password will be sent from your iPhone to your friend's device and their device will be connected to your Wi-Fi network. On your iPhone, tap Done. Make sure your iPhone is connected to the Wi-Fi network whose password you want to find. Tap the i icon next to the Wi-Fi network name. Find the Router field and write down the number listed there (this is the router's IP address). It is probably something like 192.168.0.1, but could be something else. In the Safari web browser, go to the IP address from the last step. You'll be asked to log into your router. You'll need the username and password you created when you set up the router. Hopefully you wrote this down somewhere. It's also possible that you didn't change the default username and password. In that case, it could be something as simple as admin/admin. Do some Googling for "default password for [your Wi-fi router model]" if you need guidance. Once you've logged in, each Wi-Fi router model will have a slightly different set of steps for finding the Wi-Fi password, but look for settings or the name of the Wi-Fi network and you'll be on the right track. If you're looking for the password because you're having trouble connecting to a Wi-Fi network, the password might not be the problem. Instead, there could be a problem with your iPhone. To find out, check out How to Fix an iPhone That Can't Connect to Wi-Fi.